A warm and dry home during a cold winter night makes a person feel happy, cozy and comfy. Imagine your shock when you come home to a cold house. What a shock. What happened? The most plausible explanation is that your furnace gave up the ghost. It is not working. Stare at it, curse it, and plead with it as much as you want, no reassuring sound from the burner, no heat. This nightmarish scenario happens more often than people imagine. Why is it happening now in the middle of the evening when the family needs to stay warm and comfortable? This question has a simple answer: Deferred or neglected maintenance of the heating system. The furnace was quietly sitting there all summer long without complaining. Heating systems are easy to forget when they are not needed. If you do, you may well pay the price in winter when you desperately need to heat the house. 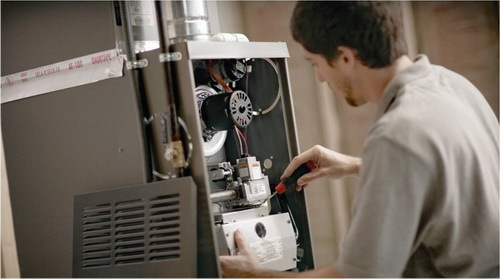 Dads can avoid many common problems with the furnace and the heating system with a little maintenance in fall. Basic maintenance keeps the heater healthy and can save on home heat as well. Everyone can perform these simple maintenance tasks. Doing so saves a lot of trouble and frustration during cold weather. On a gas furnace they should be even and blue. Yellow flames indicate a dirty burner. Remove the blower from the furnace (you may have to remove its cage) and vacuum dust of it. Then gently brush the blades with a small brush. Be careful not to bend the blades or to disturb their counterweights. Use a straw to blow dust off the light. If your furnace has an electric igniter, clean it the same way. Check the belt for cracks and fraying or other signs of wear. Replace it when needed. You should check and replace it every three months. You can use a cheap filter. They do a good job keeping dust and dirt away from the blower and blower motor. High-efficiency filters can impede air flow. Ask the manufacturer for a recommendation. For any other heater problem or for serious repairs, consult with and hire a professional maintenance company. You will save on home heat.